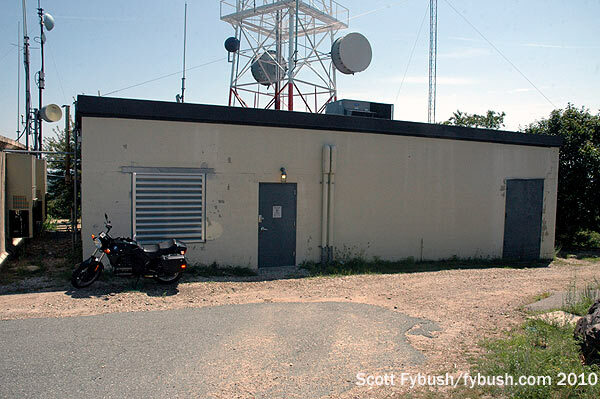 Boston’s most powerful FM station is also the only major FM in town still using its inaugural transmitter site – and the only one in town that derives its callsign from its transmitter site. 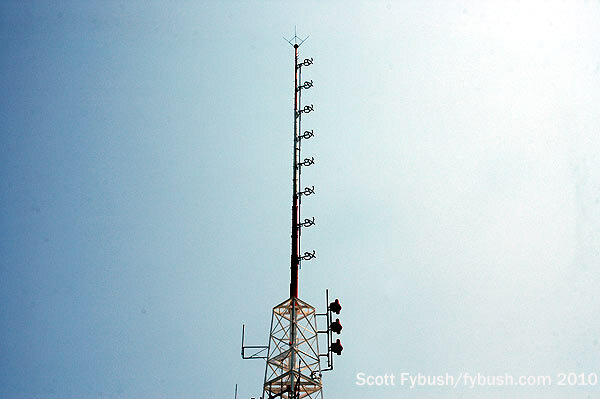 Back in 1951, when the Lowell Institution put its new educational FM signal on the air at 89.7 on the dial, it needed a callsign, and rather than turning to any of the many cultural and educational groups that made up its membership, it chose to name the new signal after Great Blue Hill in Milton, home to its transmitter. Thus was born “WGBH,” and that’s the real story, no matter how many times someone tries to claim it stands for “God Bless Harvard” or somesuch. 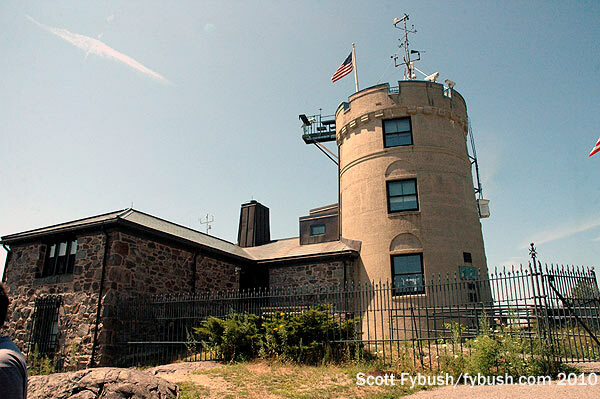 When WGBH-FM signed on six decades ago, and when WGBH-TV (Channel 2) joined it in 1955, Great Blue Hill already had nearly a century of scientific innovation under its figurative belt: in 1885, the Blue Hill Observatory took root on the hill’s 635-foot summit, the highest coastal point between Maine and Long Island Sound. That same vista must surely have made Great Blue Hill a natural choice for WGBH’s founders. In 1951, the downtown Boston skyline was much more modest than today’s, with few skyscrapers on which an FM station could be mounted (the tallest, the original John Hancock Tower, was already home to WHDH-FM 94.5). The TV tower farm in Newton and Needham was still a few years away from being built, and presumably the only other possibility for a WGBH transmitter site was the hill above Malden Hospital to the north of Boston where WNAC-TV/FM and WEEI-FM had their towers. 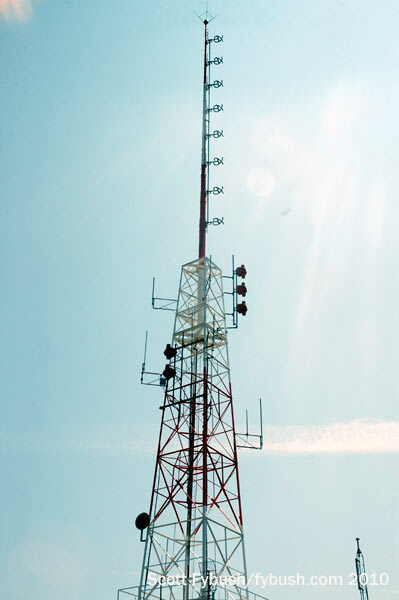 Great Blue Hill offered a much better view into Providence and westward into central Massachusetts and Connecticut than the Malden site, and in those days of relatively empty FM dials WGBH’s 15.5 kW carried across most of southern New England. 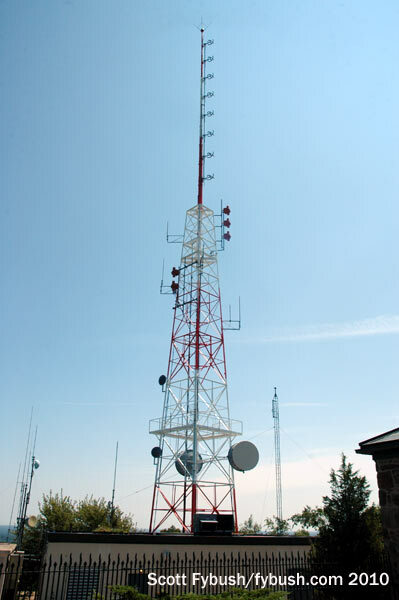 In the 1960s, WGBH-TV ended its brief run on Great Blue Hill when Westinghouse donated space at the WBZ-TV (Channel 4) tower in Needham to provide greater tower height for Channel 2 and its new sister station, WGBX (Channel 44). 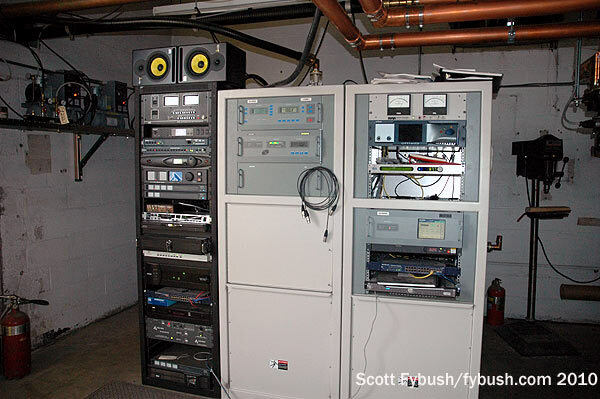 When the TV station decamped, the FM station stayed put, boosting its power from 50 to 70 to a full 100 kilowatts by the end of the decade to better reach outlying listeners – and to be heard by other noncommercial stations that picked up WGBH-produced Eastern Educational Network shows for over-the-air relay in their own markets. At the top of the hill, the blocky WGBH building sits just across from the turn-of-the-century observatory building, recently restored and open to the public most summer weekends. Inside, it’s awfully spacious for an FM transmitter these days, and understandably so, what with all the room the TV transmitters once took up here. 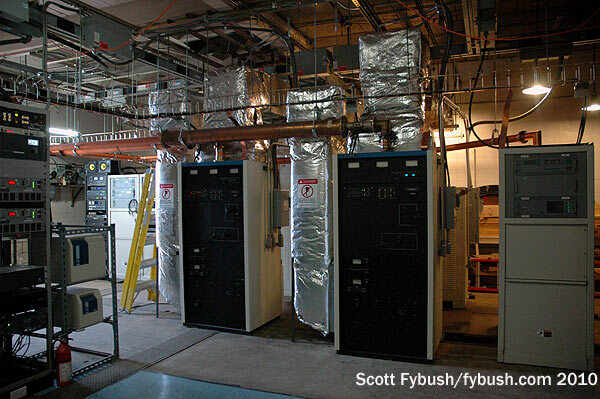 Entering the WGBH building, there’s a generator room on our left and a row of racks straight ahead that includes STL gear, processors and exciters. 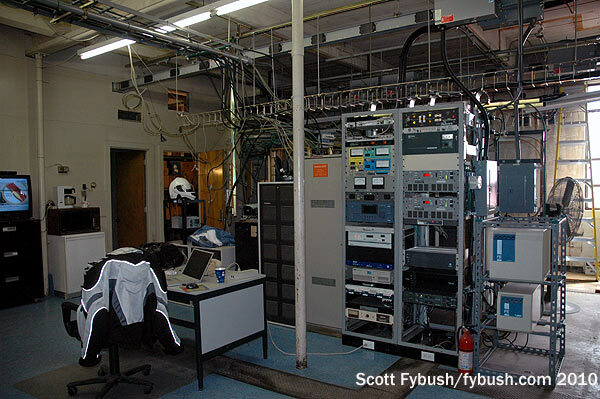 Behind those racks sits a bunch of two-way gear and the transmitter for the National Weather Service signal up here, KHB35 (162.475 MHz). WGBH no longer has Great Blue Hill to itself. Not only are there a bunch of antennas up here for the State Police and other two-way services, using two shorter towers next to the big FM tower, there’s also a second FM signal now operating from a two-bay Shively antenna on the south face of the FM tower. This is Entercom’s WKAF (97.7 Brockton), the latest incarnation of the station that started out as WBET-FM back in the 1940s in Brockton proper. 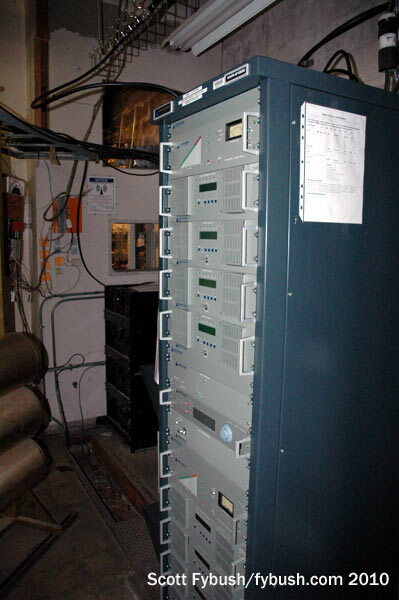 WBET-FM became WCAV and eventually moved north to a site in Abington – and then it ended up in the hands of Radio One, which flipped it to WBOT and then WILD-FM and brought it up here to the hill as a 2050-watt/568′ class A signal, only to sell it to Entercom, which now uses it to augment the WAAF (107.3 Westborough) signal in Boston. WKAF, in turn, almost ended up with Great Blue Hill to itself: a few years back, WGBH tried to move 89.7 to Needham to join its TV sisters. The move would have traded the grandfathered 100 kW power (technically 98 kW these days if you don’t count a bit of beam-tilt) for more height, but it ran afoul of third-adjacent protections to Boston College’s WZBC (90.3 Newton) and never got built – and so the radio station named for Great Blue Hill will stay put here for some time to come. Thanks to WGBH’s Dennis Correia for the tour! 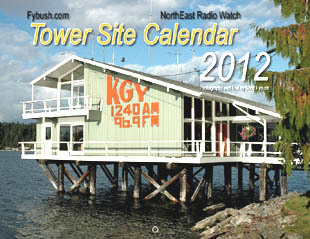 Check out our spring clearance specials on the world-famous Tower Site Calendar 2012, available from the all new Fybush.com store! Want access to more than a dozen years’ worth of Tower Site of the Week? All our archives, fully searchable, are available to Fybush.com subscribers – and you get full access to NorthEast Radio Watch, too! Subscriptions start at just $15. Sign up here! And don’t miss more IDs next Wednesday, over at our sister site, TopHour.com! Although it is probably unintended, note that WGBH, backwards, the letters “HBG” (omitting the W) , are the initials of Hartford B. Gunn, for many years a previous WGBH general manager who oversaw major improvements and expansions. Thanks for the updated tour. I haven’t beeen up there for a while.